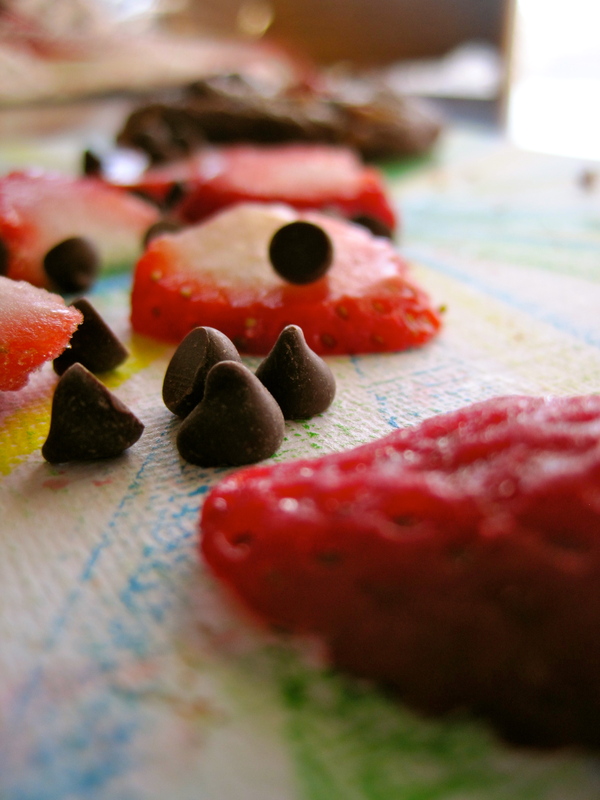 My friend Nisha and I had strawberries on hand one evening (Ok, ok… it was Valentine’s Day. We had a girls’ night planned complete with gourmet truffle mac ‘n cheese, chocolate covered strawberries, wine, and a romantic comedy). We had planned on making chocolate covered strawberries, but as the time drew near, we both agreed that we were craving cookies instead. Solution? 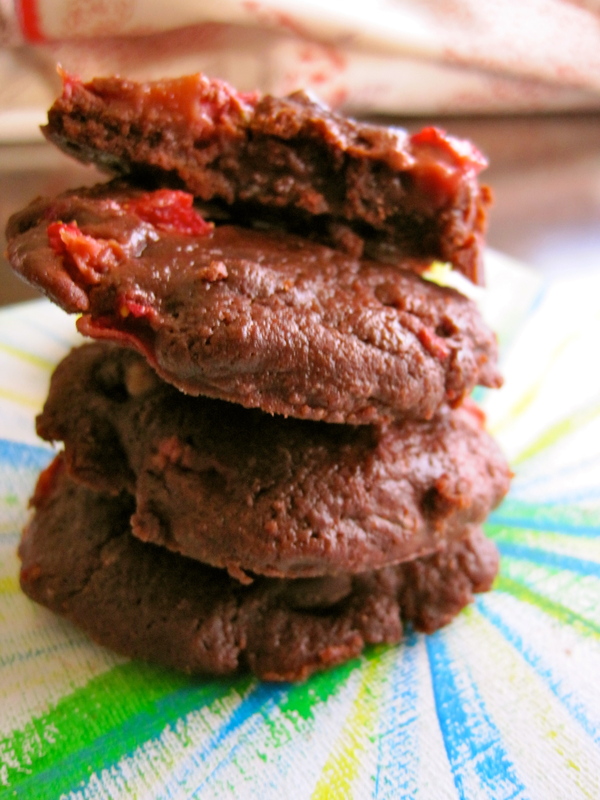 Chocolate covered strawberry cookies, of course! Nisha was a little hesitant to add fresh strawberries into a cookie, but I assured her that it would turn out well and be delicious (I had no idea what I was doing; my fingers were crossed the whole time). The base we used for the cookie was the rich, chocolatey base Sally uses in her death by chocolate peanut butter chip cookies. We followed the recipe almost exactly, but instead of 1 cup semi-sweet chocolate chips and 1 cup peanut butter chips, we added 2/3 cup semi-sweet chocolate chips, 2/3 cup white chocolate chips, and 2/3 cup chopped strawberries. 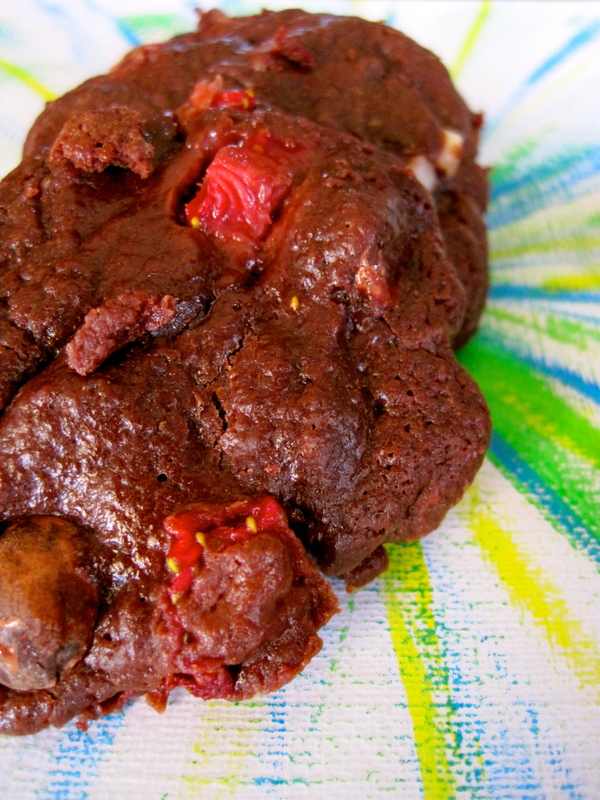 The result was the fudgiest, most decadent cookie I’ve ever had, with a refreshing tart strawberry bite that made it irresistible. 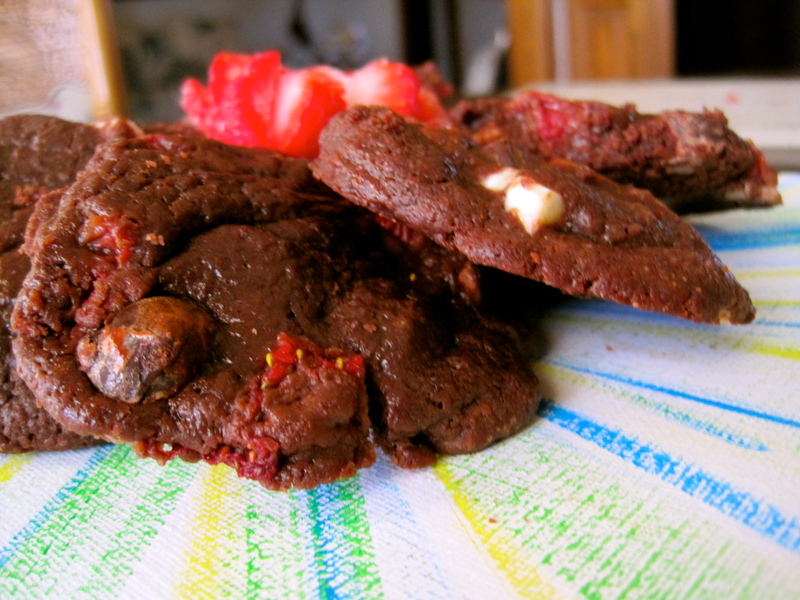 The richness of the chocolate melted into the cookie paired with the chocolate chips and white chocolate made me drool, but the strawberry kept me coming back for more. Although these cookies were good fresh, they were unbelievable the next day, after spending a night in the refrigerator. It was like taking a bite out of amazingly indulgent, cool fudge. An important note is that they MUST be kept in the refrigerator. Once you taste them after they’ve been cooled, you won’t be complaining. Promise. they make up for it in taste. In the scorching heat of summer, these cooled cookies with a tall glass of milk would be the ultimate refreshment, don’t you think? If you make these, please check back in and let me know how they turned out for you! 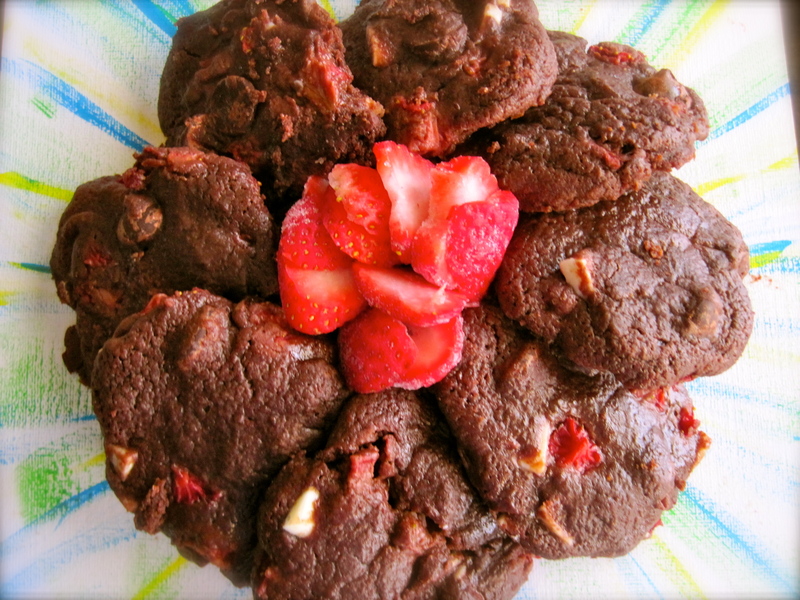 This entry was posted in Food, Recipes and tagged chocolate, chocolate chips, chocolate covered strawberries, chocolate covered strawberry cookies, cookie, cookies, dessert, easy, friend, fudge, recipe, recipes, simple, strawberries, strawberry, white chocolate. Bookmark the permalink.